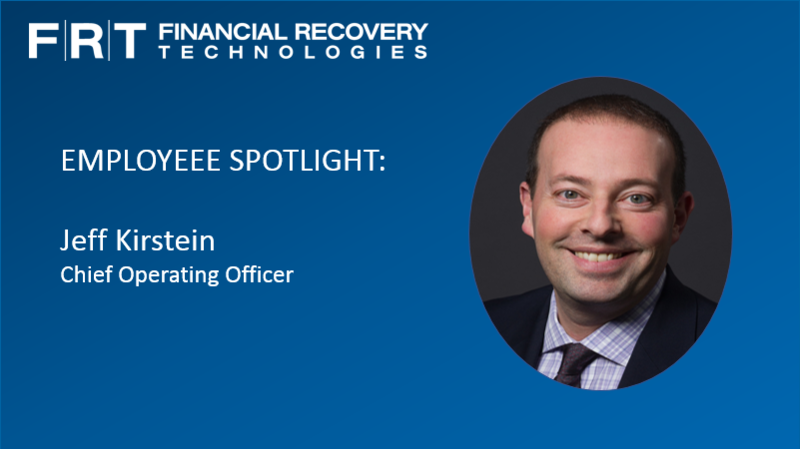 Jeff Kirstein is the Chief Operating Officer for Financial Recovery Technologies. Jeff has been at FRT since inception and has oversight of all operational aspects of the business. This include case sourcing, data collection and normalization, eligibility and damage analysis, claim filing, deficiency remediation and legal research. With 20 years of financial services experience, he brings expertise working with custodians, prime brokers, fund administrators and legal counsel. His previous role was as Director of Operations for a hedge fund and he also worked as an equities trader and a financial consultant. My role is to oversee the operations department which is comprised of data specialists, case specialists, claims analysts and the legal and research team. Our top priority is to identify and execute on all shareholder actions around the world to ensure our clients have the opportunity to recover whenever and wherever they are impacted. My biggest challenge is balancing work and home life. It is very difficult for me to unplug as I am constantly thinking about what I can do to make FRT better. It doesn’t matter what time it is, what day of the week it is, or where I am – I am always available and constantly writing ideas and notes on my phone. I pride myself in being there for our clients and employees but I also realize there are times where I should put down my phone and computer and fully focus on family time. My biggest achievement is being the second employee at FRT. I was running operations for a hedge fund that was closing and we were looking for someone to buy the rights to our current and future class action claims which is how I met the original President of FRT. We ended up discussing the business in-depth and there was no question in my mind that FRT was a great idea. I ended up being his first hire and fast forward 10 years and there are now 80 of us. I am extremely proud of the role I have in the growth of the company. Especially in the beginning, there were a lot of really long days and I wore many, many hats, but without question it was all worth it. I feel very lucky to be part of such an amazing team. The amount of pride our employees have in their work and the dedication they have to our clients and FRT is evident every day which speaks to our incredible team and how each and every one of them embodies our company’s core values. FRT is constantly doing research on the class action industry which enables us to produce a vast array of thought leadership content. We also regularly speak to the key stakeholders in the industry to ensure we are aware of anything that might impact the class action landscape. We always listen to our clients to best understand their needs and try to ensure an unsurpassed client experience. For example, we were first to market with our global group litigation offering as well as our antitrust offering. These products have really enhanced our client experience and further differentiated us from our competition. There is no substitute for hard work, so try to get the most out of every day and never wait for tomorrow to do what you could today. Also, putting the client and the company ahead of your own personal interests will lead to the best outcome for everyone. Whenever I interview a candidate, I always say that working on my team starts with caring and trying. That is the baseline I expect from all of my employees. We all know that unfortunately mistakes happen, but if the mistake was due to something other than lack of effort, then we can use it is a teaching moment and implement additional processes and controls to ensure it doesn’t happen again. Success is defined based on happiness and a big part of being happy is appreciating what you have instead of focusing on what others have. I am extremely lucky to wake up every day excited to go to work. I am so thankful for the people around me and the fantastic work environment at FRT. I imagine not everyone at FRT is as excited as me each morning, but I do know there are a lot of smiling faces in the office and an extremely low employee turnover, so we are doing something right.